History: (X-Men Millennial Visions 2001 - "X-Men: War to Come" (fb) - BTS) - Upon discovering that he only had months to live, Magneto decided to act immediately, causing a fight between the X-Men and the Brotherhood of Mutants in New York City. 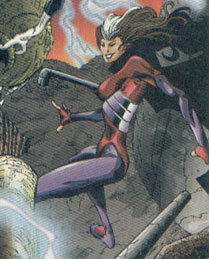 During the fight, Storm was critically injured and Rogue, attempting to halt the battle, absorbed some of Magneto's energy. Unfortunately, Rogue was overwhelmed with the mind and personality of Magneto, whose psyche took over Rogue's body and with a new body, Magneto continued his plans. In Rogue's body, he soon broke into the High Evolutionary's Savage Land fortress and discovered a virus that would destroy the human race. Using the virus, Magneto/Rogue killed millions instantly and the world's governments captured most of the mutants in an effort to discover a cure for the plague unleashed by Magneto. 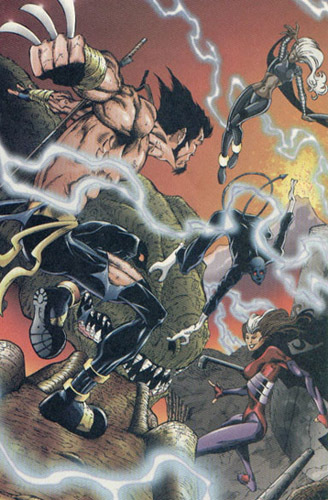 (X-Men Millennial Visions 2001 - "X-Men: War to Come") - Wolverine, Storm, and Nightcrawler tracked Magneto/Rogue to the Savage Land, where they engaged him/her, with the fate of the world hanging in the balance. Comments: Created by Lee Ferguson and Victor Llamas. When Magneto discovered he was near death, he set out to accomplish his goal of mutant supremacy before it was too late. The X-Men arrived to stop him and during the battle, Rogue permanently absorbed the persona and mind of Magneto, who quickly took Rogue as a new host body. Using Rogue's body, Magneto unleashed a virus that destroyed millions of humans and caused the world's governments to imprison mutants to find a cure. The X-Men soon tracked him in Rogue's body to the Savage Land, where they battled him. Due to his mind being trapped in Rogue's body, Magneto had her ability to absorb the powers and memories of others. He still possessed the same magnetic manipulation abilities that his Earth-616 counterpart had. --X-Men Millennial Visions 2001 - "X-Men: War to Come"
Nightcrawler was one of the three surviving X-Men when Magneto's virus caused the governments to enslave mutants. He aided his teammates against Magneto in the Savage Land. 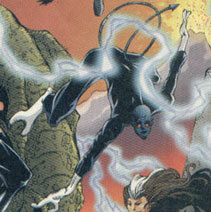 Nightcrawler had the same teleportational abilities of his Earth-616 counterpart. During a battle with Magneto in New York, Storm was critically injured. After she recovered, she remained with the X-Men as they battled Magneto in the Savage Land. 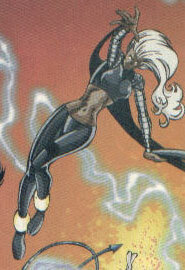 Storm had the same weather manipulation abilities of her Earth-616 counterpart. Wolverine remained with the X-Men after their battle with Magneto that saw Rogue lost to them. After the battle, he turned to his samurai training, while remaining with the X-Men. He possessed the claws of his Earth-616 counterpart, as well as presumably, the healing factor and senses. All other characters mentioned or pictured are &trade; and © 1941-2099 Marvel Characters, Inc. All Rights Reserved.